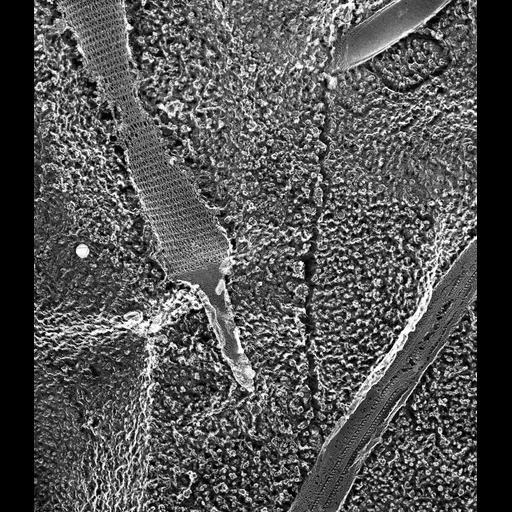 A high resolution image of portion of an isolated cilium exposing two rows of outer dynein arms arising from subfiber A of each doublet. The heavy chains of the dynein complex are linked to the microtubule by stems that can be seen in this micrograph. Thin protrusions link the dynein heavy chains to the adjacent doublet. Much of this cilium is still covered by the ciliary membrane. Also included in this image is an extruded trichocyst. TEM taken on 6/7/88 by C. Schroeder with Zeiss 10A operating at 80kV. Neg. 19,800X. The raw film was scanned with an Epson Perfection V750 Pro. This image is best used for quantitative analysis.